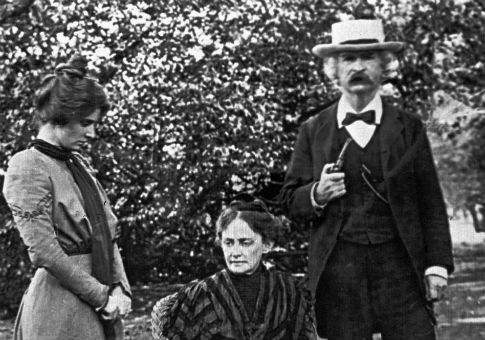 In the summer of 1893, Mark Twain was 57 and at the pinnacle of his career—or so it seemed. Behind him were the successes of Tom Sawyer (1876) and Huckleberry Finn (1885). Pudd'nhead Wilson was being serialized in The Century, one of America’s most prestigious literary magazines at the time, and would be published as a book the next year. Twain was making up to $1,000 (roughly $30,000 in today’s dollars) for a single essay or story and was married to a coal heiress. To top it all off, he owned his own publishing company. He was also broke and deeply in debt. His publishing house, named after and briefly run by his niece’s husband, Charles L. Webster, started with a bang in 1885, publishing his own Huck Finn and Ulysses S. Grant’s memoirs, which turned out to be a surprise record-breaking hit. But a series of poorly-selling titles and a badly planned, 11-volume set of American classics (which, while popular, put the company as much as $22 in the red for every sale) sent revenue and profits sharply downward. Eight years after it had started, Charles L. Webster & Co. was over $6 million in the hole. Twain had also invested heavily in James W. Paige’s promising but ultimately flawed typesetter, the Paige Compositor. The American author had gone from a pauper to a prince and back to a pauper—at least on paper. How he’d become a prince again is the story of Richard Zacks’s expertly paced Chasing the Last Laugh: Mark Twain’s Raucous and Redemptive Round-the-World Comedy Tour. As Zacks’s subtitle tells us, Twain would go on an unprecedented world speaking tour beginning in the summer of 1895. The tour would take him across the American Midwest to Vancouver and then on to Australia, New Zealand, India, and South Africa. He would perform over 100 times in front of aristocrats, British generals, New Zealand ranchers, and Indian maharajas in over a year. Sigmund Freud even heard him speak in Vienna after the tour was over. Zacks notes that Twain hated going on "the platform," as he called it, to recount humorous episodes from his books, which he always memorized and delivered in a deadpan Southern drawl. But he decided that it was the only way for him to get back on his feet again. It was also a way to leave New York, where he risked being called on by the police to settle his accounts. He took his wife and his middle daughter, Clara, leaving his two other daughters, Susy and Jean, with friends and family. The tour got off to a bumpy start in Cleveland. Twain, suffering from a carbuncle on his leg, was unable to practice as much as he would have liked before the first paying audience. But he quickly found his stage legs and regularly performed in sold out houses to mostly rave reviews. While Twain wondered how American humor would play with audiences in Australia—the first stop outside the United States and Canada on the tour—he was surprised to find Australians more like Americans than even the English: "No shyness; get acquainted in five minutes," he wrote. His first performance brought down the house. He performed before audiences of 2,000 in Sydney, four times larger than most of his American shows. Zacks writes that "What had started for him as a desperate lunge for money was starting to seem magically transformed into a victory lap for the ‘humorist of the century.’"
I suspect that one of the temptations in a book on Mark Twain is to allow Twain to do all the writing. With zingers like "There is but one love which a Frenchman places above his love for his country, & that is his love for another man’s wife," it must be hard to resist. But Zacks does an admirable job of giving us a taste of Twain’s performances and quoting his best commentary without, for the most part, overwhelming the narrative with block quotes. Zacks notes, for example, that for all the success that Australia brought him, Twain was ambivalent about the country itself. The average Australian, he wrote in his notebook, "is as sensitive" about his country "as men are of their sacred things—can’t bear to have critical things said about her. Thinks he is going to build a mighty nation here, & someday be an independent one—a republic—cut up his 60[,000] & 100,000-acre sheep runs into farms, maybe—irrigate the deserts, &c—Federation is sound; but better not hurry to cut loose from England." But Twain fell in love with India. He was astonished by the colors and the chaos, as well as the strangeness of the locals and their customs. While he disliked and tended to denounce oppression wherever he saw it (his wife mostly kept him from making gauche comments to Australian reporters), he thought imperialism worked in India, and even praised Britain’s harsh response to the Mutiny of 1857: "The military history of England is old and great, but I think it must be granted that the crushing of the Mutiny is the greatest chapter in it." After India, the three Clemenses travelled to South Africa, where Twain allowed himself to become involved in a dispute between the Dutch Boers and the English, before they headed to England at the end of July in 1896, where Twain began work on his travel book. As successful as the speaking tour was, Twain wouldn’t have come close to paying his debts had it not been for the help of Henry Huttleston Rogers, a 53-year-old executive at Standard Oil and one of America’s wealthiest men. Chasing the Last Laugh is as much about Rogers’s financial housecleaning and stewardship of Twain’s business affairs and the friendship between the two as it is about Twain’s "raucous" tour. Rogers’s son-in-law bought Webster’s leaky Library of American Literature, and the Standard Oil man, to whom Twain had given the right of attorney, transferred the rights of all of Twain’s work to his wife to protect it from his creditors. Equally important, Rogers negotiated a collected works to be co-issued by two competing publishing houses after Twain’s tour. This would be his major source of income for years to come. Zacks also casts new light on Twain himself. He’s the same impetuous, soft-hearted man as he is in Ron Powers’s excellent biography. What becomes clearer in Chasing the Last Laugh is just how rash and gullible the man was when it came to managing money. A mere 10 days after he finally paid off his debts in full, Twain wrote Rogers a gushing letter about a new "Designing Machine" built by an Austrian inventor that would supposedly revolutionize the carpet and textile industries. While Twain’s proposed investment fell through, he would eventually buy stock in a company that sold Plasmon, a German milk powder extract that Twain claimed had cured him of lifelong indigestion. It would have little success in either England or America. His wife’s insistence that he pay all his investors back in full—against Rogers’s advice—endeared him to the American public, making him even more popular after his financial failures than before. In short, it wasn’t just the speaking tour that remade Twain, it was H. H. Rogers and Olivia Langdon Clemons. Without them, he probably would have ended his life bitter, unloved by the public, and if not poor at least unwealthy—that is, as only Samuel L. Clemens and not Mark Twain. Micah Mattix is an associate professor of English at Regent University and a contributing editor at The Weekly Standard. He edits the literary newsletter Prufrock.